Toronto has an amazing community of people who have opened up and appreciated the brand for what it is – it’s a city of early adopters... so diverse and so willing to accept new things. When Mitchell Stern, Steve Ballantyne and Mike Roy opened their brewery in Toronto’s Junction Triangle last fall, they had no idea that the neighbourhood – which is rapidly becoming synonymous with craft breweries – had only recently lifted its alcohol ban in 1997. Luckily for them, the storied history of the area meshes well with the brewery given that Station Cold Brew Coffee Co. doesn’t make beer, they cater to the caffeine-fueled crowd. It was Steve who initially came up with the idea to launch Toronto’s first cold coffee brewery after sampling the good stuff while on a mission to New York’s Centre for Social Innovation on behalf of Toronto’s CSI. Sure, some Toronto cafes and roasters had taken to brewing small batches, but Steven wanted to go big so he brought Mitchell onboard for his marketing expertise and Mike as the missing link, the brewmaster. Station did a couple of tastings and focus groups surrounding their cold brew products, tapping into the diverse array of entrepreneurs at the co-working and meeting space. “We took some really great feedback from the community and CSI which helped us get to our signature cold brew coffee,” says Mitchell. Shortly after, the trio began hawking its cold brew through its first breakfast chain customer in June 2014, while interest in Station’s coffee continued to rise. Hence launching the brewery in September. Since then Station has seen a lot of walk-in traffic, people coming in and getting 64-ounce growlers filled from the companies cold brew taps and kegs or picking up bottles form the bottle shop. In time, Mitchell sees Station’s cold brew coffee spreading across Canada in time, but there’s something intrinsically Torontonian about the brand, something fueled in part by the city’s increasingly internationally recognized food and cocktail culture and the community growing around it. 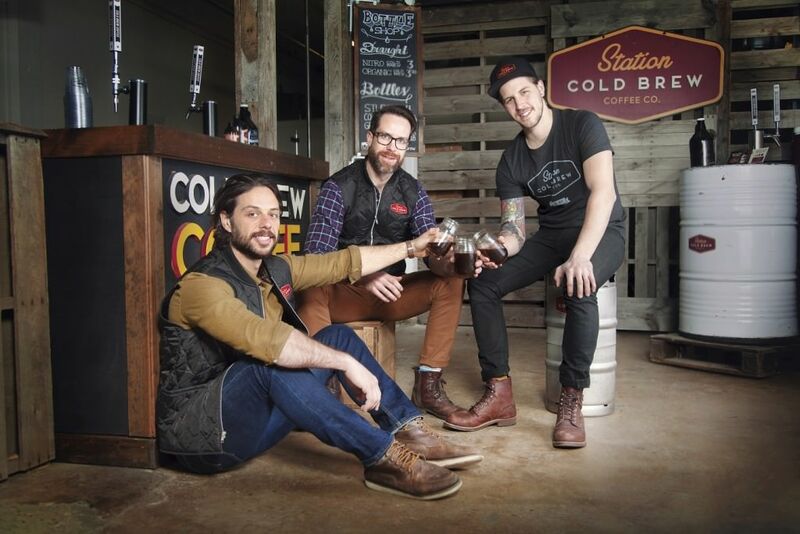 Station Cold Brew is Toronto's Original Cold Brew Coffee Company. The slow brew begins with fresh, locally roasted beans sourced responsibly through direct trade channels. A temperature-controlled system uses cold water and 18 hours of time, instead of heat, to slowly extract the flavours of the coffee. The result is a smooth, naturally sweet and rich coffee, with no bitterness and is up to 70% less acidic. Station's goal is to help change the beverage market by offering all-natural premium beverages to Canadians.